The effect of sulfate-reducing bacteria (SRB) on the corrosion of 907 steel was investigated. Results demonstrated that the chemical composition of corrosion products, the corrosion rate, and corrosion type were altered due to the adherence of SRB and the subsequent formation of biofilm on the 907 steel surface. Different from the case in sterile medium that ferrous oxides predominated in the corrosion products, ferrous sulfide was an important component in SRB-containing medium. Meanwhile, corrosion of 907 steel was enhanced by SRB, and the corrosion rate was dependent on their metabolic activity, which increased, stabilized, and decreased in the exponential growth, death, and residual phases, respectively. Furthermore, the corrosion type was changed from uniform corrosion to localized corrosion with the introduction of SRB, and the development process was analyzed based on the current distribution map of wire beam electrodes. In sterile medium, the maximum current density decreased with the immersion time extended, and there were no significant anodic current peaks in the late period, while in SRB-containing medium, the ratio between cathodic areas and anodic areas was high in the exponential growth phase, and stable anodic sites formed gradually in death and residual phases, which facilitated the development of localized corrosion. Marine environment is a natural habitat for a large variety of microorganisms, and their attachment to surfaces and formation of slimy biofilm will affect corrosion behavior of metal facilities, which is termed as microbiologically influenced corrosion (MIC). MIC is a vital cause for corrosion failure of marine infrastructures and leads to financial losses of billions of dollars each year (Ref 1). Sulfate-reducing bacteria (SRB), gaining energy from the oxidation of organic compounds or H2 by the dissimilatory reduction of sulfate or other partially oxidized inorganic sulfur species to sulfide (Ref 2), have long been viewed as the most influential members of microorganisms involved in MIC. Numerous work has been devoted to the influence of SRB on the corrosion of metals since the first report appeared in 1934 (Ref 3), and so far several mechanisms have been proposed such as cathodic depolarization by hydrogenase and sulfide (Ref 4), chelation of extracellular polymeric substances (EPS) toward metal ions (Ref 5), direct electron transfer from Fe0 (Ref 6), and biocatalytic cathodic sulfate reduction (Ref 7). The validity of these corrosion mechanisms is dependent on SRB strains, metal material features, and medium characteristics. 907 steel, a high-strength low-alloy steel, is widely utilized in the construction of marine ship hulls due to its good mechanical properties and resistance to corrosion. Most reports have been focused on its galvanic corrosion coupled with other metals (Ref 8, 9), and little is known about its corrosion behavior influenced by microorganisms. To be the best of our knowledge, there has been only one report from Duan et al. (Ref 10) concentrated on 907 steel corrosion affected by microbes. They covered 907 steel surface with an artificial biofilm consisting of SRB cells and agar, and found that coupons corroded more severely in nutrient-rich medium than in natural seawater. Although this work sheds some light on 907 steel corrosion in the presence of SRB, it suffers several defects such as the absence of control designs without SRB and the lack of impact from biofilm development process. Therefore, comprehensive research is highly desirable in this topic. MIC is an electrochemical process, and electrochemical methods such as polarization curve and electrochemical impedance spectroscopy (EIS) are commonly adopted to investigate the corrosion behavior of metals influenced by microorganisms. Unluckily, these conventional electrochemical techniques provide average corrosion information, leaving local electrochemical characteristics unknown, which is not beneficial for the comprehension of the MIC process that is recognized as a typical localized corrosion due to the heterogeneity of the biofilm attached to the surfaces (Ref 11, 12). Although localized electrochemical methods are highly desirable in MIC study, there are still quite limited reports on this. The reported techniques include scanning vibrating electrode (SVT) (Ref 13), local electrochemical impedance spectroscopy (LEIS) (Ref 14), and wire beam electrode (WBE) (Ref 15). In comparison with SVT, no probe is involved in WBE, and therefore, it overcomes the problem of the interference from the probe contamination by biofilm absorption in SVT. In the meanwhile, the analysis of WBE data is simpler than that of LEIS. Consequently, the WBE method has advantages over the other two techniques in MIC investigation. In our previous work, the WBE technique has been employed to study MIC of copper and Q235 carbon steel, and the current distribution map gives a straightforward indication for the localized corrosion (Ref 16, 17). 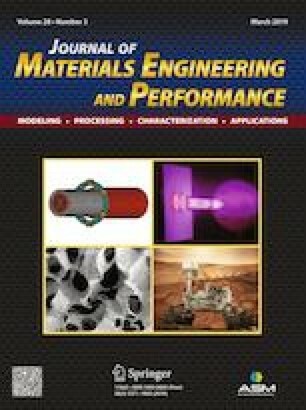 In this study, corrosion of 907 steel was investigated in media with and without the inoculation of SRB by the combination of surface analysis, conventional and localized electrochemical methods, and the role of SRB was ascertained. Furthermore, the corrosion mechanism was discussed in relation to the growth states of SRB. Coupons were cut from a piece of 907 steel sheet with the composition (wt.%) of 0.120 C, 0.790 Si, 1.010 Mn, 0.007 S, 0.420 Cu, 0.050 Ti, 0.640 Cr, 0.670 Ni, 0.016 P, and balance Fe. Cylinders with a diameter of 5.0 mm and height of 5.0 mm were used for conventional electrochemical measurements and surface analysis, and they were embedded in epoxy resin to leave only one end surface (19.6 mm2) exposed to aggressive electrolyte after copper wires were soldered. A WBE was prepared by the assembly of 112 steel wires (diameter 1.5 mm) into an array of 11 × 11, and the distance between each wire was 1 mm (Fig. 1a). Prior to electrochemical measurements, the electrode surface was sequentially abraded with a series of silicon carbide papers with grit sizes of 400, 600, 800, and 1200 #, cleaned by ethanol in ultrasonication bath, dried by nitrogen, and sterilized by ultraviolet for 30 min. The bacterium identified as Desulfovibrio sp. was isolated from marine sludge in Bohai Sea of China. The modified Postgate’s culture solution was used as the culture medium, and it consisted of 2.0 g magnesium sulfate, 0.5 g dipotassium hydrogen phosphate, 1.0 g ammonium chloride, 0.5 g sodium sulfate, 0.1 g calcium chloride, 1.0 g yeast extract, and 4.0 ml sodium lactate per liter of seawater. Culture medium was autoclaved at 121 °C for 20 min. After cooling, SRB seed culture with the 4-day old was inoculated, and then electrodes and rubber stopper were assembled rapidly. Figure 1(b) displays the schematic diagram of WBE setup. All the vessels were kept at 30 °C in a thermostatic incubator. The quantity of active SRB (NSRB) was detected by the most probable number (MPN) method according to the American Society for Testing and Materials (ASTM) Standard D4412-84 (Ref 18). The surface morphology of coupons exposed to media for diverse time was examined with a scanning electron microscopy (SEM, JSM-6700F; JEOL Ltd.; Tokyo, Japan). After the samples were taken out from the media and rinsed with sterilized natural seawater, they were immersed in a phosphate buffer solution containing 2.5% glutaraldehyde for 2 h to fix the biofilm. And then coupons were dehydrated successively with an ethanol gradient (15 min each): 30, 50, 70, 90, and 100%. Subsequently, they were dried at critical point, sputter-coated with gold, and subjected to SEM analysis. To observe the corrosion morphology beneath corrosion products and biofilm, the coupons were cleaned with the Clark’s solution (ASTM G1-03) before SEM characterization. Chemical composition of 907 steel surface immersed in sterile and SRB-containing media for 13 days was obtained by x-ray photoelectron spectroscopy (XPS, Thermo ESCALAB 250, Waltham, MA, USA). The C 1 s hydrocarbon peak was calibrated at a binding energy of 285.0 eV. Peak fitting was performed using software XPS Peak-fit 4.1. Open-circuit potential (EOC) and EIS experiments were performed on a CHI604D station (CH Instruments, Inc.; Texas, USA) with a three-electrode system, in which an Ag/AgCl (KCl-sat.) and a platinum wire were used as reference and counter electrodes, respectively. EIS studies were carried out at EOC using a 5 mV amplitude sinusoidal signal with a frequency range of 10−2 to 105 Hz, and the data were fitted with ZSimpWin software. Similar to those reported in the literature, the current distribution of WBE was measured using a test device (NI PXI-1042Q) consisting of NI PXI-8108 embedded controller and modular instruments: NI PXI-2535, PXI-4022, and PXI-4071 (Ref 16). After a WBE was immersed in media, all wire sensors were connected to allow electrons to move freely among wires. When current was recorded, each individual wire was separated temporarily from the wire array in sequence, and all the other wires were shorted together. The galvanic current between the temporarily separated wire and the residual wires was recorded by PXI-4071 and PXI-4022. All measurement processes were controlled via a self-designed program in LabVIEW environment. During the current measurements, the interval between two channels was 1 s. The current distribution maps were drawn with the Surfer 10.0 software. Figure 2 displays the growth curve of SRB, which can be divided into three stages: an exponential phase, a death phase, and a residual phase. In the first 3 days, NSRB increased exponentially, and then decayed quickly. Bacteria are highly active in the exponential stage (Ref 19-21), and there is a high rate of nutrient consumption and metabolite accumulation. For the present bath culture model, the consumption of nutrients and accumulation of metabolites restricted the further increase in SRB quantity and promoted their decay, which occurred from the third day. After the 11th day, the nutrients in the medium were almost exhausted, and the growth process reached the third stage. During the residual phase, NSRB went back to the original level, and the active cells almost disappeared. SEM images of 907 steel exposed to sterile and SRB-containing media for different times are shown in Fig. 3. In sterile medium, a small amount of corrosion products dispersed randomly on the surface at the time of 2 h, and scratch lines from the pretreatment were clearly observed. 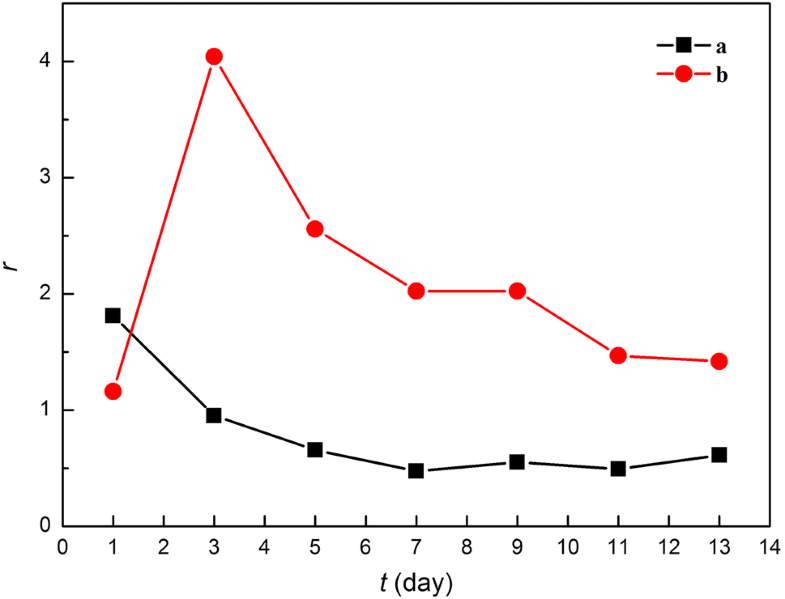 When the exposure time extended to 1 day, the morphology did not change significantly except for a slight increase in the number and size of corrosion product particles. Subsequently, a thin film began to cover the surface at the third day, and the scratch lines became blurred. After 13 days of immersion, a dense layer with several small humps was formed on the 907 steel surface. Distinct from the samples in sterile medium, bacteria and their EPS accumulated gradually on the surface with increasing the exposure time in SRB-containing medium. Small loose aggregates mainly composed of EPS appeared on the surface after 2 h of immersion and quite few bacterial cells were observed. The size of aggregates increased when the exposure time rose to 1 day, and in the meanwhile, the quantity of attached SRB cells grew. 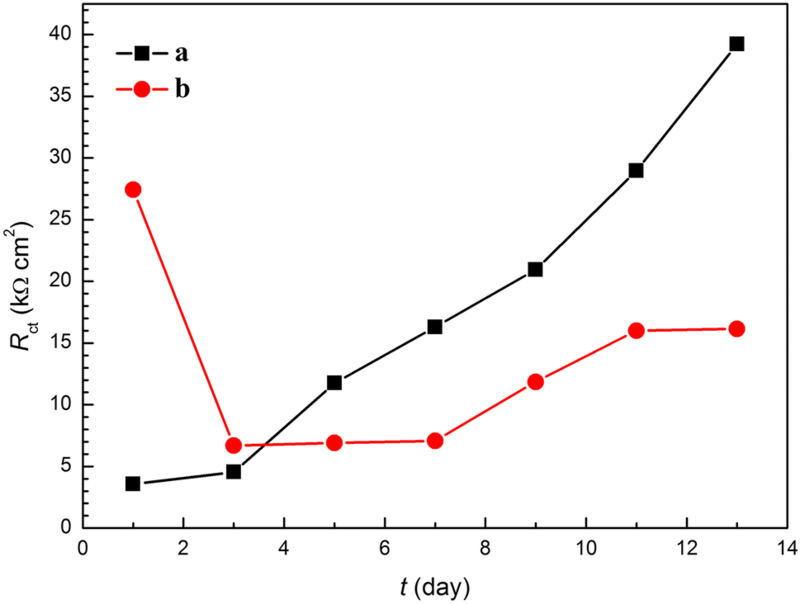 EPS accumulated rapidly on the surface during the exponential stage from day 1 to day 3 due to the vigorous metabolic activity of SRB, which facilitated the adherence of bacterial cells. The attached SRB cells, in turn, benefited the further accumulation of EPS. As a result, 907 steel was totally covered by a thick film consisting of EPS and bacterial cells on the third day. Although the planktonic SRB decayed from the third day, there were still a few cells present in the film on the 13th day. Long-term survival of SRB on steel surface is in good agreement with the report by Chen et al. (Ref 22). 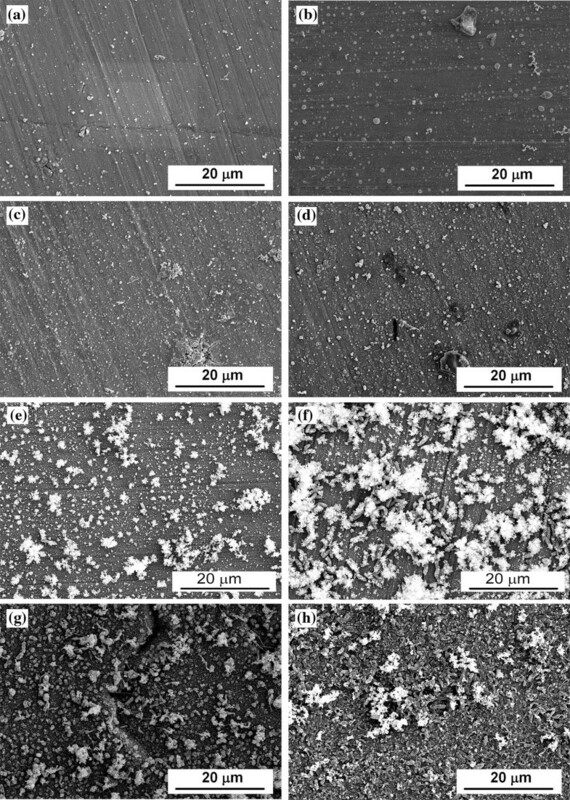 Figure 4 exhibits SEM images of 907 steel substrates after the removal of biofilm and corrosion products. After 13 days of immersion, samples in sterile medium suffered slight and uniform damage, while the corrosion of coupons in the medium containing SRB was worse and severe pits with different diameters were distributed unevenly on the surface. Consequently, the presence of SRB resulted in localized corrosion of 907 steel. The presence of SRB altered the corrosion morphology of 907 steel, and their influence on the chemical composition of corrosion products was further investigated by XPS, and the results are displayed in Fig. 5. 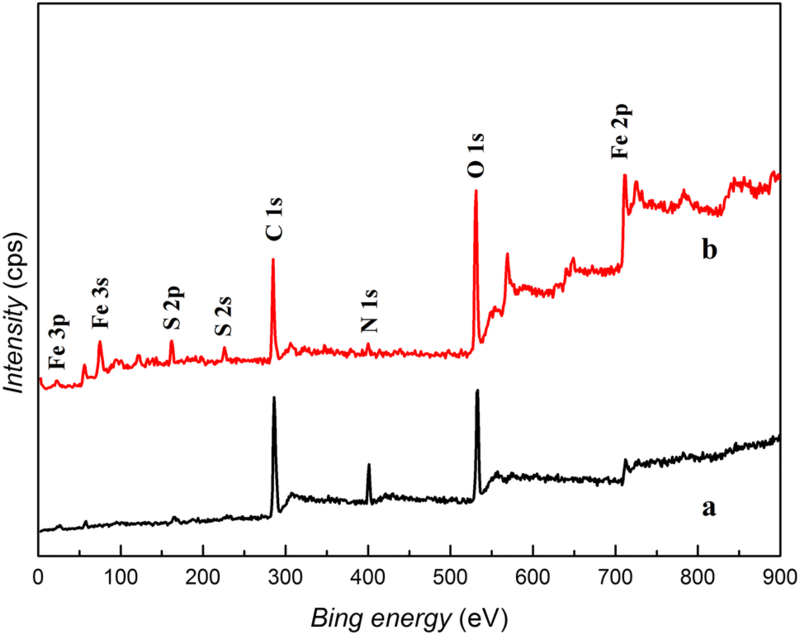 As shown, characteristic peaks for Fe, S, C, N, and O elements were observed on the wide spectra of coupons exposed to sterile and SRB-containing media. In comparison with the case in sterile medium, the proportion of element S in the sample from SRB-containing medium was much higher, indicating that sulfide from metabolism of SRB participated in the corrosion process of 907 steel. 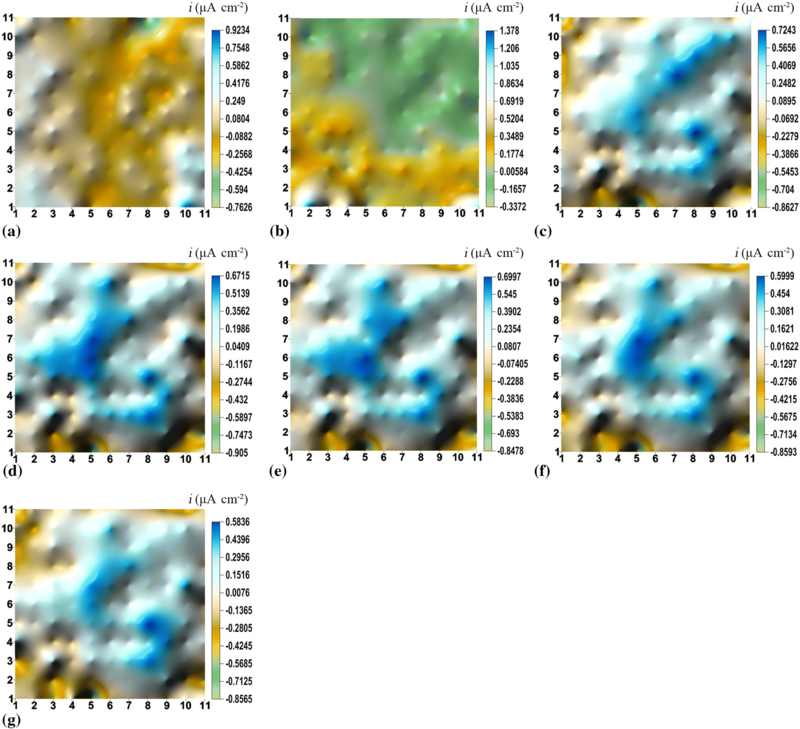 Figure 6 depicts the high-resolution Fe 2p3/2 and S 2p spectra of samples after 13 days of immersion in both media, and their deconvolution was achieved by the curve-fitting procedure using the Peak-Fit 4.1 software. The Fe 2p3/2 spectrum in the sterile medium could be divided into three peaks at the position of 710.4, 711.8, and 713.0 eV, corresponding to FeO, Fe3O4, and FeSO4, respectively (Ref 23-26). Fe3O4 generated via Schikorr reaction is common in the anaerobic corrosion of iron and carbon steel (Ref 27). The relative content of each component is summarized in Table 1, and the proportions of FeO, Fe3O4, and FeSO4 were 60.02, 32.45, and 7.53%, respectively. Therefore, iron oxides predominated the corrosion products in sterile medium. The Fe 2p3/2 spectrum in SRB-containing medium also consisted of three peaks, and the peak at 710.6 eV could be assigned to FeS, a typical corrosion product induced by SRB (Ref 28). Furthermore, the high proportion of FeS (46.91%) indicated that the metabolic activity of SRB resulted in a transformation from iron oxides to iron sulfides. Figure 6(c) exhibits the high-resolution S 2p spectrum for the coupon in sterile medium. Peaks at 162.6 and 163.7 eV were ascribed to the adsorbed organic sulfur-containing compounds (Org-S) from culture solution, and the other at 167.2 eV corresponds to SO 4 2− (Ref 29, 30). According to the result in Table 1, most sulfur was present in the form of Org-S (76.06%). When SRB cells were inoculated, besides the two peaks for Org-S, another two appeared at the position of 161.2 and 162.2 eV. These two peaks could be attributed to FeS (Ref 31), which is in accordance with the result displayed in Fig. 6(b). Meanwhile, FeS gave a proportion of 67.30% in the total sulfur. Thus, the adherence of SRB on 907 steel surface altered the corrosion type and chemical composition of corrosion products, leading to severe localized corrosion and the generation of FeS. Figure 7 illustrates the variation of EOC with respect to time in sterile and SRB-containing media. It could be seen that the value of EOC shifted positively at the beginning of the experiment, and then started to stabilize from the fourth day in sterile medium. The gradual accumulation of corrosion products on the surface hampered the diffusion of corrosive species toward the steel substrate, and accordingly protected the coupon against further corrosion. In SRB-containing medium, EOC of 907 steel was more negative than that in sterile medium, and it varied with the growth states of SRB. In the exponential growth period (1-3 days), EOC decreased rapidly and reached a minimum value. This was closely related to the sulfide from bacterial metabolism, which accelerated the metal dissolution process (Ref 32). There was a slight positive shift of EOC during the death period, and the formation of biofilm on 907 steel played a key role in the ennoblement (Ref 33-35). EOC keeps stable in the residual period, which might be associated with the reduction in the biological activity of bacteria and the deposition of corrosion products. 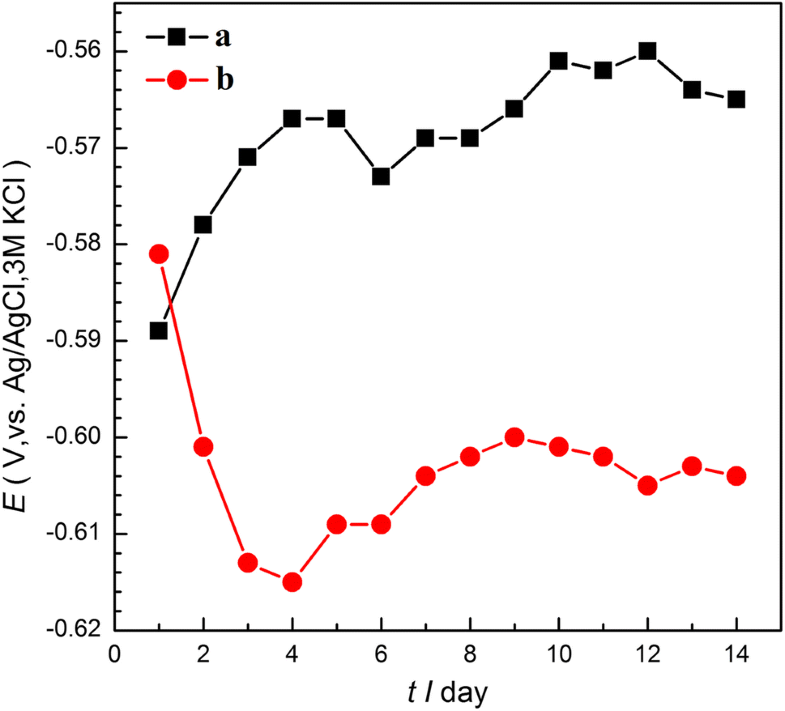 Figure 8 shows Nyquist plots of 907 steel in sterile and SRB-containing media for different times. In the sterile medium, there were only impedance loops in the plots, and the diameter increased with time. This demonstrated that the corrosion rate was substantially controlled by charge transfer process, and it decreased with time. In combination with the SEM results, the diameter increase in the Nyquist plot was considered to be caused by the gradual formation of a dense corrosion product film (Ref 36). 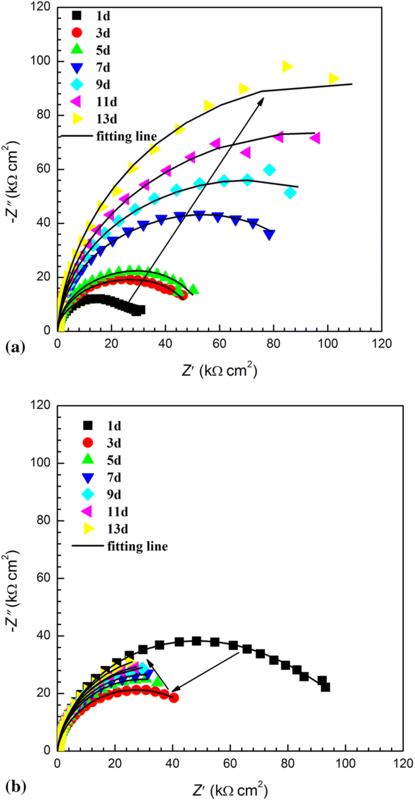 In SRB-containing medium, diameters of impedance loops decreased in the exponential growth phase and increased slightly during the death and residual phases, implying that corrosion of 907 steel was accelerated during the exponential growth phase and inhibited in the other two phases. 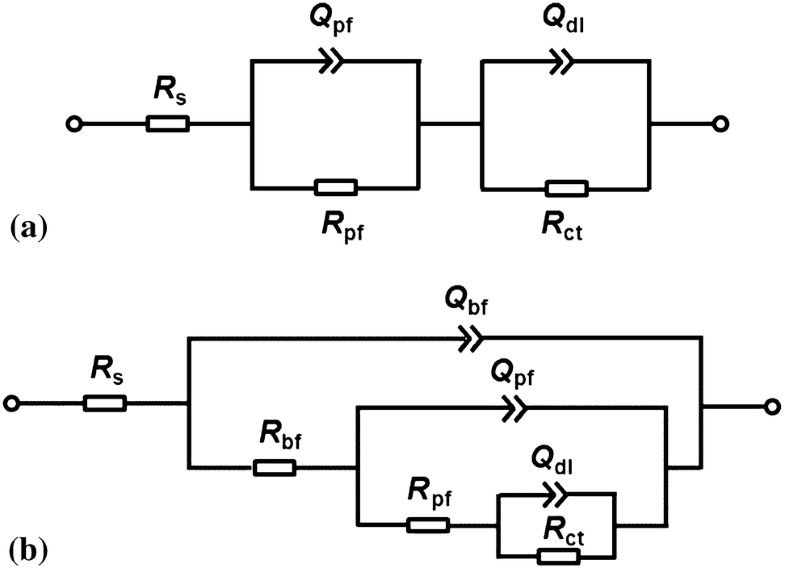 The impedance spectra were further analyzed by fitting with proper equivalent circuits shown in Fig. 9. In the sterile medium, it was observed from SEM images that a uniform corrosion product film covered 907 steel surface gradually, and consequently a two-time constant model was adopted, which consisted of the corrosion product layer and the electrical double layer (Ref 37). 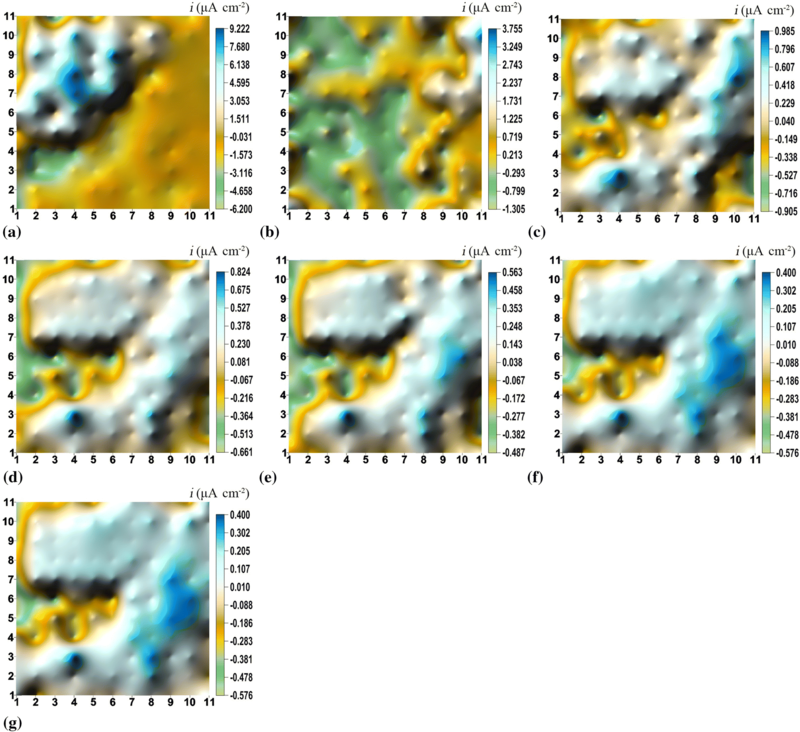 In SRB-containing medium, a three-constant time model was selected based on the contribution of each phenomenon, such as the adsorption of biofilm, the formation of corrosion product film, and the presence of electrical double layer (Ref 16). where Y0 is a parameter related to capacitance, ω is angular frequency, j is the imaginary number, and n is an exponential term associated with the roughness of electrode surface (Ref 38). Qbf, Qpf, and Qdl are CPEs of biofilm, corrosion product film, and electrical double layer, respectively. Rs, Rbf, Rpf, and Rct correspond to the resistance of electrolyte solution, biofilm, corrosion product film, and charge transfer, respectively. According to Stern–Geary equation, Rct is inversely proportional to the corrosion rate, and its variation with time in different media is shown in Fig. 10. Rct increased with time in the sterile medium, which was attributed to the gradual formation of protective corrosion product film that reduced the corrosion rate of 907 steel. The value of Rct in SRB-containing medium was larger than that in sterile medium on the first day of exposure, which might be ascribed to the protection from EPS (Ref 39). Rct decreased sharply from day 1 to day 3, when SRB cells were in exponential growth phase and their quantity increased dramatically, and it was believed that the high concentration of corrosive metabolites (sulfide and organic acids) was responsible for the increased corrosion rate. After the slight change from day 3 to day 7, Rct increased when the residual phase came, which could be ascribed to the low metabolic activity of SRB and the increase in the thickness of biofilm and corrosion product layer (Ref 40). EIS results confirmed the important role of SRB in the corrosion of 907 steel again, and the influence was metabolic activity-dependent. Corrosion morphology revealed in Fig. 4 demonstrated localized corrosion induced by SRB, and the WBE technique was further employed to give deeper comprehension of the localized corrosion process. Figure 11 and 12 depicts the temporal evolution of current distribution maps of WBE in sterile and SRB-containing media, respectively. In the sterile medium, the maximum current density (imax) was 9.222 μA cm−2 after 1 day of immersion, and it decreased to 3.755 μA cm−2 at the time of day 3. Subsequently, the values of imax were smaller than 1.000 μA cm−2, and decreased gradually. When the fresh 907 steel WBE was introduced into the electrolyte, it was susceptible to corrosion attack since it was naked without any protection, resulting in a high imax. Corrosion products generated and accumulated with time on the electrode surface, retarding the corrosion process, and lower imax was expected. Furthermore, the distribution of anodic and cathodic sites changed with time. At the time of day 1, anodes concentrated on the area with the corners of (2, 9), (6, 9), (6, 7), and (1, 6), and these sites behaved as cathodes at day 3 with the new typical anodes at locations of (11, 10), (11, 8), and (1, 1). 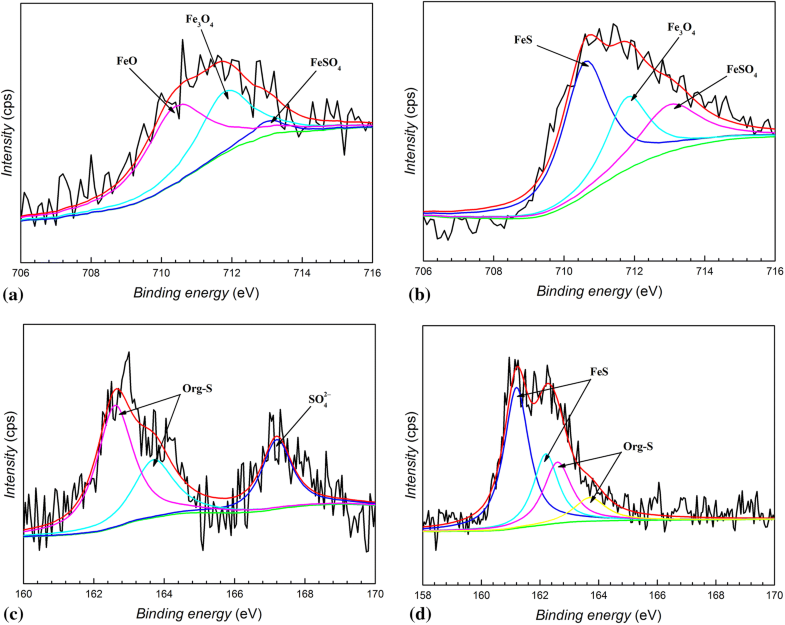 The initial anodic sites might be due to their lower activation energy from material feature and polishing treatment, and their polarity reversal was closely related to the accumulation of corrosion products. After day 5, sporadic cathodic sites among large anodic area turned to anodes gradually [such as sites of (8, 4) and (8, 8)], and cathodes concentrated on limited sites, demonstrating the development of stable galvanic corrosion. Different from that in sterile medium, imax was just 0.9234 μA cm−2 at the first day, and increased to 1.378 μA cm−2 at the time of day 3. Subsequently, it stabilized at ca. 0.7 μA cm−2 during 5-9 days, and decreased to ca. 0.6 μA cm−2 at the end of the test. This evolution trend was also positively correlated with the growth curve of SRB. Similar to the case without SRB, the distribution pattern of anodic and cathodic sites changed greatly before day 3, and then stabilized. The initial anodic current peaks located at the position of (10, 1) and (2, 1) vanished after 3 days of exposure, and new peaks with the position of (8, 5) and (5, 7) appeared on the fifth day in the death period, which could still be observed in the residual period. This demonstrated that the electrochemically active sites turned up at the beginning were not stable, and some stable sites formed gradually with the immersion time extended. The heterogeneous biofilm composed of SRB bacterial cells and their metabolites caused local gradient differences and the enlargement of active sites (Ref 41), resulting in the localized corrosion of 907 steel. To clarify the relationship between localized corrosion of 907 steel and metabolic activity of SRB, the variations of the ratio between cathodic and anodic areas (r) as a function of immersion time are presented in Fig. 13. 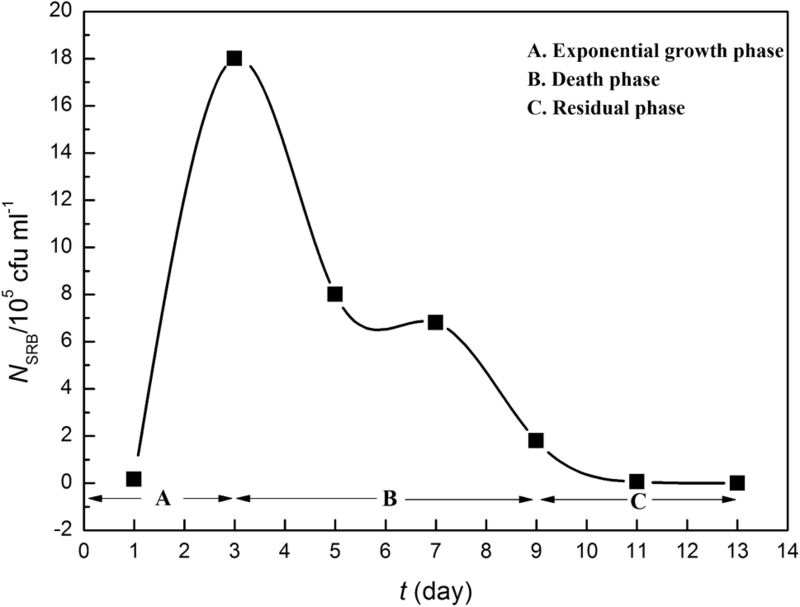 Different from the case in sterile medium, where r decreased in the first 7 days and then kept stable, r in SRB-containing medium was evidently related to SRB growth as it increased in the exponential growth period, decreased in the death period, and maintained stable in the residual period. Besides, r in SRB-containing medium was much higher than that in sterile medium from the third day, suggesting that there was a larger cathodic area and a smaller anodic area on the current distribution map of 907 steel, which benefited the development of localized corrosion. According to the classical cathodic depolarization theory (Ref 3), hydrogen evolution reaction is promoted by SRB via the utilization of atomic hydrogen, and the efficiency of cathodic depolarization highly depends on the activity of SRB. During the exponential phase, cathodic hydrogen was consumed rapidly owing to the vigorous growth and high metabolic activity, thereby promoting cathodic reaction and leading to the appearance of a large cathodic area in the current distribution map. In death and residual phases, the metabolic activity of SRB toward cathodic hydrogen utilization was reduced, and accordingly, the cathodic depolarization was weakened. These results are in good agreement with those from SEM, and the localized corrosion of 907 steel induced by SRB is confirmed. In summary, the influence of sulfate-reducing bacteria on corrosion process of 907 steel was investigated in the present work. SRB could adhere on 907 steel surface forming a biofilm intertwined with EPS, resulting in the variations in the chemical composition of corrosion products, the corrosion rate, and corrosion type. Ferrous sulfide was generated as an important corrosion product due to the metabolic activity of SRB. The introduction of SRB led to the enhanced corrosion of 907 steel, and the corrosion rate was closely related to the metabolic activity of SRB. In a growth cycle, the corrosion rate increased, stabilized, and decreased in the exponential growth, death, and residual periods, respectively. Localized corrosion was induced by SRB, and its development process was tracked by the WBE technology. Localized corrosion was facilitated via the larger ratio between cathodic areas and anodic areas in the exponential growth phase, and gradual formation of stable anodic sites in death and residual phases. This work was supported by National Key Research and Development Program of China (No. 2016YFB0300604), the National Natural Science Foundation of China (41806087 and 51771180), Key Research and Development Program of Shandong Province (No. 2018GGX104021), and AoShan Talents Cultivation Program supported by Qingdao National Laboratory for Marine Science and Technology (2017ASTCP-ES02).